The Friends of the Bourne Rail Trail are seeking a Community Outreach and Program Intern to coordinate and spearhead the organization’s program and outreach efforts during the 2019 summer season. The person in this position will help advance the development of a 6.5-mile rail trail on Cape Cod that serves as the “missing link” between the Cape Cod Canal Bikepath and the Shining Sea Bikeway. Completing the “missing link” will create a 25+ mile bike and pedestrian path connecting Sandwich, Bourne, Falmouth, and Woods Hole. Reporting to the Communications & Outreach Associate, this position is a tremendous opportunity for a dedicated, mature, and responsible self-starter to make a meaningful contribution to a rail-trail project that is still in its development phase, while gaining meaningful professional experience. This position has the potential to be molded to a candidate’s personal interest and overall career goals. College students (undergraduate and graduate) as well as teachers and others seeking temporary summer employment are encouraged to apply. This is a paid position that is budgeted for 12 weeks. The employee will be compensated at a rate of $16/hour and will be expected to work 20 hours per week. No benefits. A flexible schedule is available. An undergraduate or graduate student with an interest and demonstrated commitment to building healthy, active, and fun places to live. Others will be considered, including local teachers, with the understanding that this is a limited term position that will not exceed 12 weeks. Above all, the ideal candidate is resourceful, passionate, and takes great pride in their work. The employee must have their own transportation and be able to travel easily throughout the Upper Cape during normal business hours; the employee must have their own computer or readily available computer access during normal business hours; it is expected that the employee will work remotely, but will be located on the Upper Cape during normal business hours. This is a part time position that is funded for a maximum of 12 weeks at an average of 20 hours per week. The intern will be compensated at an hourly rate of $16. Interested candidates should email a cover letter, resume, and a work sample to Nathan Robinson at info@bournerailtrail.org. Please include the following in your email subject line: “Last Name –BRT Summer Associate 2019.” Applications should be submitted no later than 5:00 p.m. on April 26, 2019. We are excited to present our first Local TrailBlazers spotlight with Sean Polay of the Sandwich Bikeways and Pedestrian Committee. Through the committee, the Town of Sandwich is working to enhance the community with innovative biking and walking resources that will improve local transportation and recreation options as well as the regional economy. 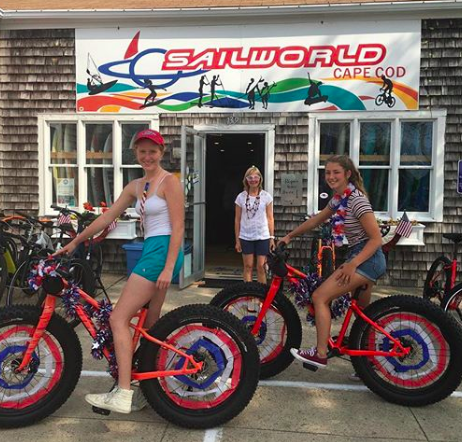 Sandwich Bikeways is an important partner organization for the Friends as we work towards our goal of connecting region to the rest of the trails of Cape Cod. We recently interviewed Sean to learn more about the exciting work being done in Sandwich. What is the Sandwich Bikeways & Pedestrian Committee? The committee’s mission is to preserve, promote, and enhance the Town of Sandwich’s biking and walking resources. Appointed by the Board of Selectmen, the committee recently steered a master-planning effort as it works toward connecting the Cape Cod Canal bike path with a planned off-road path along Service Road -- which will join a broader network of trails, both completed and in development, from Woods Hole to Provincetown. What projects are considered priorities for Sandwich? Development of a mountain bike trail system in the Maple Swamp Recreation Area, a key adjunct of the future Service Road bike path and the region’s mountain biking trail network. Advocating for infrastructure improvements on Freezer Road to better connect the Cape Cod Canal Path to Tupper Road and the community. Improving pedestrian crossing infrastructure on Cotuit and Quaker Meetinghouse roads to ensure safe pedestrian and bicycle access to the many businesses on Cotuit and existing and future recreation areas on Quaker Meetinghouse (Oak Crest Cove, plus the future skate park and tennis/pickleball courts co-located with new public safety complex). Why is it important to support bike and pedestrian projects on Cape Cod? We’re hyperfocused on the economic impact that improved cycling options can have for area businesses. As we work on connecting the canal and Service Road paths, it’s important to our committee that we ensure cyclists can make their way into Sandwich village, which provides a natural point of respite and refreshment for cyclists heading from Bourne to Barnstable and beyond -- or vice versa. It’s equally important to us that improvements in cycling and pedestrian infrastructure improve the quality of life and safety for Sandwich residents for both recreation and commuting. What does the Bourne Rail Trail represent for Sandwich Bikeways? The BRT would provide a direct, long-term benefit to Sandwich by directly connecting the Cape Cod Canal pathway with the Shining Sea Bikeway in Falmouth and serve as an important milestone in the realization of Vision 88 -- a regional effort to build a continuous shared-use path from Woods Hole to Bourne, Sandwich, and onward to Provincetown. Bourne’s effort dovetails with work in our town to connect the Cape Cod Canal pathway through Sandwich village to a planned shared-use path along Service Road. That path will eventually connect to the Cape Cod Rail Trail extension in Barnstable. It is vitally important to us that Vision 88 becomes a reality, and the 6.2 mile gap in Bourne is a critical connection. Completion of the BRT Phases 1 and 2 will have immense short-term benefit to Sandwich cyclists by creating a continuous path from Sandwich to Monument Beach and Monks Park -- two areas frequented by Sandwich residents for recreation. It also will provide greater attraction for cycling tourists who instead of terminating their ride at the Tidal Flats Recreation Area near the Railroad Bridge may continue on into Monument Beach for refreshment at several businesses there. Conversely, cycling residents of and visitors to Monument Beach may more safely reach the Cape Cod Canal pathway, enabling them to bike directly to Sandwich too. How can BRT supporters get involved with Sandwich Bikeways? The SBPC recently submitted an application to The League of American Bicyclists to be assessed as a Bicycle Friendly Community. Part of the application process includes an online public survey for residents, cyclists and advocates to share their experiences and perceptions about cycling in Sandwich. The survey is available now through March 24, and should take 10-15 minutes to complete: https://www.surveymonkey.com/r/app_BFC_SP19. Aggregated, anonymous responses will be shared with SBPC as part of the Bicycle Friendly Community Feedback Report. Regardless of whether Sandwich meets the conditions to be designated as a Bicycle Friendly Community, the assessment provides a road map for making the town more bicycle-friendly. Of course, we also welcome BRT supporters to attend our bike rodeo in April and Bike Your Park Day in September. Over the past four months, following approval of funds for the design and engineering of Phase 1 of the Bourne Rail Trail, the Town of Bourne has been making actionable progress in bringing a trail to Bourne. This progress, including hiring a firm to complete preliminary design plans, will set the groundwork for the completion of the BRT. Keep up to date on our website, which we will be updated as the project progresses! 2018 has been an exciting year for the Friends, with meaningful milestones as we continue our work to bring a Trail to Bourne. As 2018 comes to a close, we want to take a look back on this past year and thank our many supporters for helping to make 2018 such an incredible success! The Friends kicked 2018 off with a visit from the Massachusetts Bicycle Coalition (MassBike) during their ‘perambulation’ across Cape Cod. It was great to meet with the MassBike team to share the vision for the Bourne Rail Trail as they explored future and potential trails across Cape Cod. In March, the Friends hosted our first ever Movie Night, screening PBS’s Ten Parks that Changed America, an inspiring story of ten iconic parks from across the United States. In May the Friends received a grant from the Woods Hole Foundation, allowing us to expand our work in support of the BRT and ultimately a Cape-wide trail network that will extend from Woods Hole through Bourne and Sandwich and all the way to Provincetown! We are very grateful for the support of the Woods Hole Foundation! In June, the Friends, along with State Representative David Vieira, hosted a site visit of the BRT Corridor with representatives from the Massachusetts Department of Transportation (MassDOT). It was a very productive visit and we appreciate MassDOT staffers for participating in the visit. In June, we welcomed our new summer interns, Tuck and Meagen, on board! Tuck was leading the way in our TrailFest efforts while Meagen was working closely with our volunteers and developing new outreach strategies for the Friends. On Father’s Day, Board Members Nate and Alice took to the field and brought the Bourne Rail Trail to a Bourne Braves game! Alice sang the National Anthem while Nate threw out the first pitch! The Friends participated in Phinney’s Harbor Day in Monument Beach! As always, we were energized by the support we heard from the community for the Trail. On August 18th, over 200 people joined the Friends at the Aptucxet Trading Post in Bourne for the Friends’ first ever TrailFest! TrailFest exceeded all of our expectations and we were blown away by the support and excitement for the Bourne Rail Trail. Find the full TrailFest recap here and be sure to be on the lookout for our 2nd Annual TrailFest Save the Date in 2019! In September, the Friends participated in the Upper Cape Chamber of Commerce’s Cape Cod Canal Day in Buzzards Bay Park. It was a great opportunity to meet new Friends and supporters of the Trail, while participating in a fabulous community event. On September 30th, the Bourne Rail Trail Blazers joined hundreds of other riders for the Buzzards Bay Coalition’s 2018 Watershed Ride! With 30 riders strong raising over $22,000 for clean water in Buzzards Bay, the BRT Blazers were the largest and top fundraising team of the year. Thank you to all of the BRT Blazers and their supporters! BRT volunteer and 2018 BRT Blazer, Marc Doucette, received a substantial donation during the recent Watershed Ride courtesy of Kia of Dartmouth. As a thank you, Marc graciously framed our BRT Blazer Jersey for Kia of Dartmouth, hand delivered with a thank you letter. The Friends are incredibly lucky to have passionate supporters such as Marc! On October 1st, voters at the Town of Bourne’s Special Town Meeting approved $50,000 in Community Preservation funds to be used for design and engineering of Phase 1 of the Bourne Rail Trail! The funding marks a critical step in the development of the Trail. The Friends hosted our Volunteer Appreciation night to thank the dozens of volunteers who have donated their time to make the BRT a reality. From volunteering at TrailFest to participating in the Trail Ambassador Program, our volunteers are a huge part of the progress that has been made in making the BRT a reality in 2018. Thank you for a tremendously successful 2018, we look forward to continued progress in 2019! Have you read our latest seasonal newsletter yet? Click the link below to catch up on Bourne Rail Trail news! The prospects for completing the Bourne Rail Trail took a significant step forward this week when Bourne residents voted at the Special Town Meeting on Monday night to allocate $50,000 in funding to support the development of Phase 1 of the Bourne Rail Trail. The Town’s CPC Committee, along with the Board of Selectmen, had previously unanimously supported the funding request from the Town Administrator’s Advisory Committee on Pedestrian Bicycle Pathway. The Advisory Committee has identified a one-half mile segment—stretching from the Canal Path at the Railroad Bridge to the intersection of Monument Neck Road in Gray Gables—as a modest, but significant first phase for the project. This extension will directly connect Gray Gables and nearby residents of Mashnee Island with the Canal Path. Thank you to all the Bourne residents who came out to the Special Town Meeting and overwhelmingly voted in support of the project. This is a tremendous next step and we look forward to continued progress in making the BRT a reality. As we hope you’ve already heard, the first piece of funding for creation of the Bourne Rail Trail is within reach…if we all vote to make it happen. In August, the Town’s Community Preservation Committee (CPC) unanimously approved a grant application for $50,000 for the design of the first segment of the trail, running from the Railroad Bridge to the intersection of Presidents and Monument Neck Roads. This funding must now be approved by a majority vote at Bourne’s Special Town meeting, which will be held on Monday, October 1st at 7:00 p.m.
We have made tremendous progress towards making the Bourne Rail Trail a reality over the past two years. Approval of funding at the Special Town Meeting is an essential concrete next step. If approved by voters, the project will take the next steps towards development. Failure to approve the funding will delay development of the project and bring uncertainty to the Trail’s future. The Town’s failure to financially support the project will affect the availability of future state and federal funding. The Special Town meeting is a critical juncture for the project. We respectfully request that you make it a priority to attend the meeting and cast your vote in favor of funding for the Bourne Rail Trail. The Special Town Meeting is on Monday, October 1, at 7:00 p.m. in the Auditorium at Bourne High School. Due to Town Meeting rules, our place on the agenda will only be determined by lottery at the time of the meeting, so we cannot advise you of exactly when the vote on the CPC grant will take place. In fact, it is possible that it will not be considered until a second day of meeting, in which case we would ask you to be prepared to return the next day on October 2. Thank you for considering this important request and for all you have done to support the Bourne Rail Trail. An exciting step was made this month in the prospects of completing the Bourne Rail Trail. Following the overwhelming success of TrailFest, our board members attended Bourne's Community Preservation Committee meeting. During this meeting, the CPC members voted unanimously in support of a $50,000 funding request to support the design and engineering of the first phase of the Bourne Rail Trail! The funding request will now be included on the warrant of the Town of Bourne Special Town Meeting that is scheduled for Monday, October 1st. In order for the funding to be made available to the project, voters must approve the funding request on October 1, 2018. We are thrilled by this step forward and ask all BRT supporters to mark their calendars and plan to attend the Special Town Meeting to support the next phase of the BRT's development. The Bourne Rail Trail is making exciting progress and we have our community of supporters to thank for advocating for the BRT! 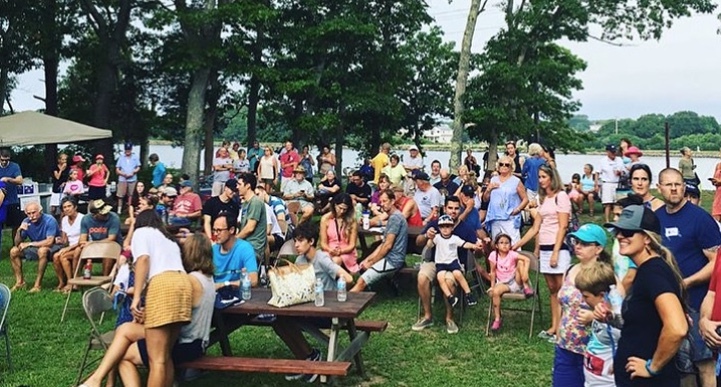 The Friends of the Bourne Rail Trail would like to extend a huge thank you to the hundreds of community members who came out this past Saturday to celebrate TrailFest along the banks of the Cape Cod Canal! We were overwhelmed with the show of support for the project and the enthusiasm that exists for paths and trails across the Cape. The afternoon was filled with excitement about the BRT in addition to summer traditions like lobster rolls, oysters, beer, ice cream, bikes, live music and one heck of a raffle! We had over 250 people in attendance and raised over $4,000 for the Bourne Rail Trail project - a true success that exceeded all of our expectations! Our intent with TrailFest was to celebrate existing paths and trails across the Cape and to raise awareness about projects still in development. 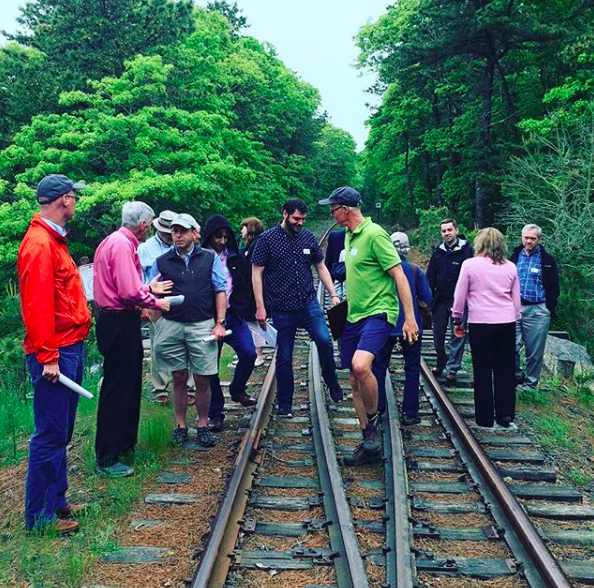 While we are dedicated to making the Bourne Rail Trail a reality, there are a number of other groups working across the region to create a Cape-wide trail network that will extend from Provincetown all the way to Woods Hole. Dubbed “Vision 88” - to represent the total miles of paths and trails – by the Cape Cod Commission, the Bourne Rail Trail is the critical link on the Upper Cape to help complete the regional network. There was certainly a buzz of excitement at TrailFest about the future of the Cape Cod and we are thrilled that the BRT is part of this enthusiasm. TrailFest would not have been possible without the help of our amazing team of volunteers and partners including Bourne Historical Society, Naukabout Beer, Monks Cove Oysters, Barking Claw, SailWorld Cape Cod, MassBike, Buzzards Bay Coalition, and Jim Decatur. A huge thanks is also due to all the businesses that donated items for the raffle! We're looking for 6 lucky TrailFest raffle winners! 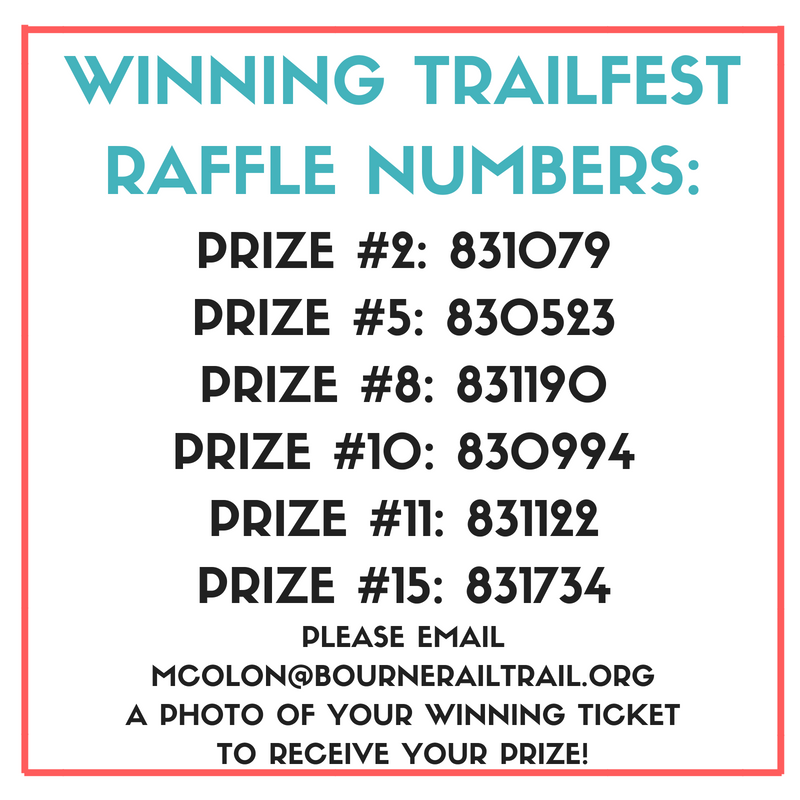 If one of these numbers is yours, email mcolon@bournerailtrail.org a photo of your winning ticket to receive your prize! This past spring, the Cape Cod Metropolitan Planning Organization (MPO) released a draft of the Transportation Improvement Plan (TIP) detailing a series of projects throughout Cape Cod for funding over the next five years. And while the Bourne Rail Trail project was mentioned in an appendix as a project requiring funding, our project was not included in the funding for this coming TIP. For the BRT to move forward within the next five years, it was crucial to have our project included in this TIP. During the review/comment phase of this plan, we called on BRT supporters to use their voices as citizens and advocates to reach out to the Cape Cod Commission asking for the Bourne Rail Trail Project be included in the next five years of planning. And our supporters came out in full force! The Cape Cod Commission received over 150 letters of support for the BRT project, astounding officials and proving to the planning committee that the BRT project is wildly supported by the Cape Cod community. We were truly humbled by this level of support and feel even more sure that the BRT project will be a success! This past week, the Friends of the Bourne Rail Trail joined in on Cape Cod Smart Transportation Week! In collaboration with The Cape Cod Commission and Cape Cod Regional Transit Authority, Cape Cod Transportation Week is an annual week-long event designed to promote transportation options that reduce traffic impacts. We were both honored and excited about the opportunity to organize a bike ride on the Cape Cod Canal in honor of smart transportation options for Cape Cod. While the weather turned out to not work in our favor, the rain didn't stop us from bringing our bikes out on the Canal! Gray Gables Market provided our riders with Cape Cod Coffee and delicious muffins as we discussed how the Bourne Rail Trail could potentially offer a whole new transportation option for the Upper Cape. We left the rainy day excited about the impact this project will have alongside the other forward thinking transporation offers throughout Cape Cod!